Get Your Copy of the 4-Step Formula Now! Did You Win 1 of the 25 Free Copies of the 4-Step Formula? Order your copy of the 4-Step Formula Now! Thanks so much everyone for your entries. I really enjoyed reading them and it’s inspiring to hear so many people dedicated to achieving lasting health in their lives. Mary, Dave, Lucas and Claudia‘s comment:Hi Muz,my family has been getting heavier every year and it has to stop. Stephany‘s comment:I think the 4 step formula will work for me because after watching your videos I’m convinced you know what you are talking about, not like other diet-gurus that have crazy programs which don’t work. I deserve a copy because I’ll use it to build a relationship with my mom while we lose weight together. You see I ran away from home when I was 15 because I didn’t like my mom’s boyfriend. I’m 28 now and want to part of her life again but after so long its difficult. We talked and I think doing this together will help us bond to be a loving mom and daughter again. Thank you very much Muz, we think you are awesome! Alexandra Boos comment:Muz,I have been a full figured model in NYC for 20 years. I always had my career as an excuse to stay in the comfort zone of being overweight. My clients would literally drop me if I became to skinny. Now I am a single mom and a spokesperson on TV. I have a huge following as a face to the full-figured consumer and it is time to stop hiding my full potential and get healthy for me, my son, and as an example to other women. I am a voice with a platform and would like your help to convey a message-love your self enough to be all that you can be. I put myself in your hands to lead me, Muz. Marcia‘s comment:I deserve a copy because I’ve been watching all your videos and see we are totally on the same wavelength. I’m a busy single mum and I’ve tried everything to lose 15lbs of ugly fat I’ve never lost after my last girl was born. Raising a family on my own is tuff and I don’t have the time to work a fulltime job so things like your book, which I’d love to have, I usually have to pass up because the needs of my kids come first. A free copy would give me the chance I need to do something for me! Pam Bentley‘s comment:I only want to lose 10lbs so I can fit in my wedding dress. I dont know if that makes me selfish because there are lots of people that need help more than me but my fiance and I hav spent just aout every cent we have on a beautiful wedding but if I don’t lose 10lbs in the next 3 weeks I’m going to have ugly back fat bulges. Please help! S kijoon‘s comment:i LOVED your videos, wow! they were amazing and free! i learnt so much frm them that I cant wait to get a copy of the 4-step formula because I know this will be the program that finally works. all the other programs seem to be based on tricks or crazy stuff but watching your videos is like going to a medical lecture because they’re so clear and well done! Debbie‘s comment:I don’t deserve to win, I’m sure there are many more deserving than me. I would love to win, I had back surgery this summer and couldn’t do much while recuperating. So I gained weight, I have a big muffin top and can’t seem to loose much weight. I don’t want to wear any of my tight clothes, because it shows off my roll and I hate it. I would love to know what to do. Help!! Thanks . Tess‘s comment:You are a good person, its easy to see from your voice and the things you write on your blog. I totally believe that you totally believe in the things you teach. Plus, any intelligent person can see those things are well thought out and not scams or gimmicks. If I was going t get just one book this year to live a more healthy life this would be it because I think its going to be an amazingly helpful for me, my family and so many other people. Susan‘s comment:I have tried several different commercial methods of weight loss to no avail. I am interested in your program because I need to lower my cholesterol and lose weight as I cannot take the statin drugs. I am also very interested in what your choices of foods would be, and I wish to use a healthy method of weight loss, which I believe your program encompasses. Looking forward to knowing more about your 4-step formula, and the secret source. 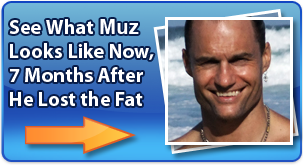 Amberley‘s comment:Hi MuzI think your 4-Step Formula will help me and anybody else who needs to lose weight because your great videos show that you really understand the issues of losing weight. I’m positive that the obesity epidemic can be directly linked to our growing insulin resistance, our excessive consumption of HFGS and our lack of effective exercise. All points which you’ve covered in your videos. Kerry‘s comment:I deserve to win a copy of your 4-Step Formula because I believe I would be a good ambassador for your product as I have a very busy lifestyle BUT am also very lazy as well. I need something that is easy and that keeps me interested while still having fun, I have read your previous steps and I am still interested – to me thats the first step for me to transform my lifestyle to a healthy lifestyle, one that will make me much happier and nicer person to live with – that is all good. Sarah‘s comment:my dad and my uncle both died of a heart attack before they were 50 and now I can see my brother heading the same way. He so wants to get thinner but our family is not healthy and we have no idea how to do it. Watching your videos has been amazing. We’ve learned more from the 3 secret videos than we have in … well, ever. I know the 4-Step Formula can put my bother on the path to outliving our dad and much older. Don‘s comment:Muz, I am probably one of your oldest individuals who are deserving of this. I am a 58 year old coach and former personal trainer and I have two artificail knees as a result playing football. I trained people with your HIRT system and I am familiar with the basics of your nutritional philosophy. I give you more credibility as a result of my experience. This is a life style change,not just a resolution for the year. I am your man. David A‘s comment:hey Muz,I am a 41 year old male just like you but i don’t show how old i am, most people tell me i look much younger. I am going to the gym almost everyday but even though i am seeing some results i am not seeing the full results that i am looking for , like the defined body like you have. I am not working right now and money is tight for me right now, like almost everyone else. But soon i will be working as a nursing assistant and i want to be healthy and be able to do my job with 110% commitment and i think that if i had this program i know that will be able to have the energy and ability to do my job without me worrying about being burned out by the end of my shift. So if i won this program it would be the best thing that i could have to keep my body and mind healthy and strong to do everything in my life with the 110% commitment that i want to give in everything that i do. Thank you so much for giving this opportunity for 25 people to win your amazing program. Derek‘s comment:I am an example of a so called “too busy working person” that has allowed my waistline to grow to a point of embarrassment. I know that if properly guided while following your 4-Step Formula, I would stay motivated and inspired, I could work the program and with its results, look and feel great. I would be a walking billboard, willing to tell anyone who asked how I got here. I feel like a represent 40-something folks out there that desire a healthy lifestyle but are too lazy or do not know how to lose and maintain their weight. My motivation is to be around living,to see my childrens’ children. Frank Poster‘s comment:I saw your video and it looks like something that is good for me. The way my work is and I go to school I can’t really find the time to work out or eat rite. I go to acting school. I tried many diets and one diet I lost about 55 pounds but I end up gaining it all back. It was basically a tuna,tea,and veggie diet. I’m always on the move so I eat fast food a lot, but listening to your program if I can get me a nice routine goin like the one your program got I’m sure I can reach the ideal weight I wanna achieve. Also I have heart disease and diabetes that run in my family and I wanna stop this from happening to me before it even starts. And I believe with your help I can do this and be healthier than I ever been. Thank-you. Tamara Scott‘s comment:I believe that I should win your 4-step formula because I just made 18 and I want my last few months of high school to end with a smile. I have always been fat and miserable, and I just want to be able to have fun. I’ve tried programs, which resulted in an epic fail. I am constantly teased about my weight by strangers and my own family. They don’t know how it feels to go shopping and leave crying because there are only regular people’s clothes. Trust me, if you give me a free copy, I will succeed. Missi‘s comment:I’ve been obese since I was about 19 years old. I’m a 41 year old mother of two (2) boys. I know if I don’t do something about it I’m going to die young. I know I am not teaching my children correctly, because I am obese & can not get out & play with them, please help. Your videos reallly gave me hope and they are the first thing in a long time that I actually believe would work for me. Please help me so that I can help my family. PLEASE!!! Seen Weight Loss Secret #1 video yet? This 1 short video has the power to change your body shape for the better, forever. You must watch it if you want any hope of losing fat!